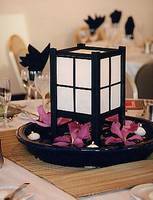 I found a picture that shows the lantern centerpiece idea. My own interpretation will use a couple moss covered mounds to pick the flowers into. Since the wedding date was moved to april, theoretically the flower arrangement should become easier.